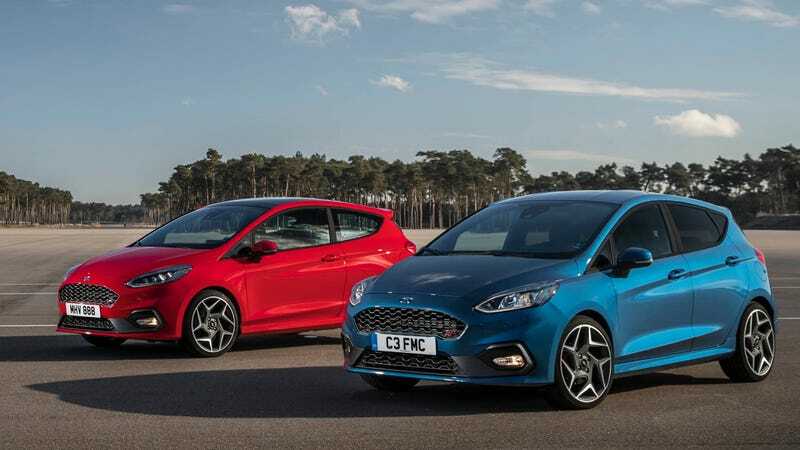 To add insult to injury, the 2018 Ford Fiesta ST, which probably won’t make its way stateside, is actually packed with a bunch of cool enthusiast stuff that any American would love to have IF THE CAR WOULD JUST COME HERE. Launch control. In a Fiesta ST. A three-cylinder, manual, economy-car-based hatchback. An affordable one! These are features that you’d find on another car that costs easily three times as much as the FiST does. Here’s a video of the FiST being driven around in a sporting manner. This could be you, if you don’t live in the United States. If I sound salty, it’s because I absolutely am. This is just another example of a cool car that we don’t get here because a carmaker probably thinks not enough people will buy it. Because we’re all about SUVs and crossovers and not about the little cars. What’s even more messed up is that the Fiesta ST was absolutely something you could buy here until very recently. It was great. And now we don’t get the updated and undeniably cool next generation. Ford has refused to confirm to us whether the new FiST will come to our shores, but at this point it really seems like it won’t.